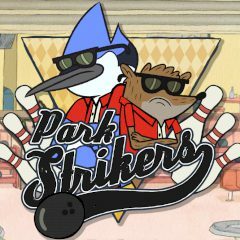 The Regular Show characters play bowling. The incoming tournament will show the best bowling player among the heroes of the cartoon. Can you help one of them to achieve it? Pick your favourite Regular Show character and start the Bowling championship. It will be difficult for you because your friends are not the same skill and while some opponents won't cause any difficulties the other one will show the skills. Choose the difficulty and start playing the bowling ladder!